Signed (to the front end-paper) first UK HB edition. Synopsis: Playing with the form he created in his trailblazing debut novel, The Invention of Hugo Cabret, Brian Selznick once again sails into uncharted territory and takes readers on an awe-inspiring journey. Ben and Rose secretly wish their lives were different. Ben longs for the father he has never known. Rose dreams of a mysterious actress whose life she chronicles in a scrapbook. When Ben discovers a puzzling clue in his mother\u2019s room and Rose reads an enticing headline in the newspaper, both children set out alone on desperate quests to find what they are missing. Set fifty years apart, these two independent stories--Ben\u2019s told in words, Rose\u2019s in pictures--weave back and forth with mesmerizing symmetry. How they unfold and ultimately intertwine will surprise you, challenge you, and leave you breathless with wonder. 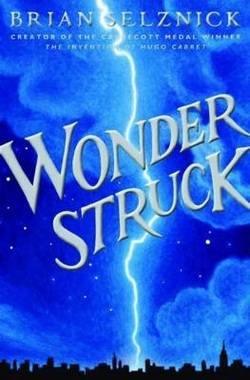 Rich, complex, affecting, and beautiful--with over 460 pages of original artwork--Wonderstruck is a stunning achievement from a uniquely gifted artist and visionary.